My children love to use sidewalk chalk to draw works of “art” on our driveway. 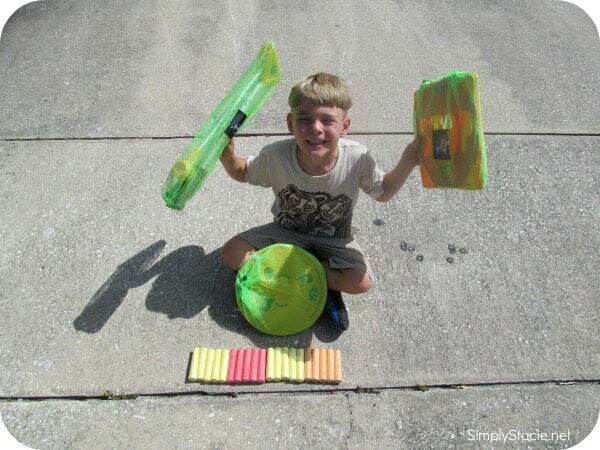 It is a fun summer activity that is always a big hit with their neighborhood friends too. Chalk City® elevates outdoor chalk to new levels with a fun Activity Kit that allows kids to create their own obstacle course. The Chalk City® Activity Kit is so creative and fun that my children have been playing with it for over an hour at a time. Our Activity Kit set included 1 Road Maker, 3 Road Sign Stencils, 3 Obstacle Course Stencils, 20 pieces of Side Walk Chalk and an Activity Booklet. 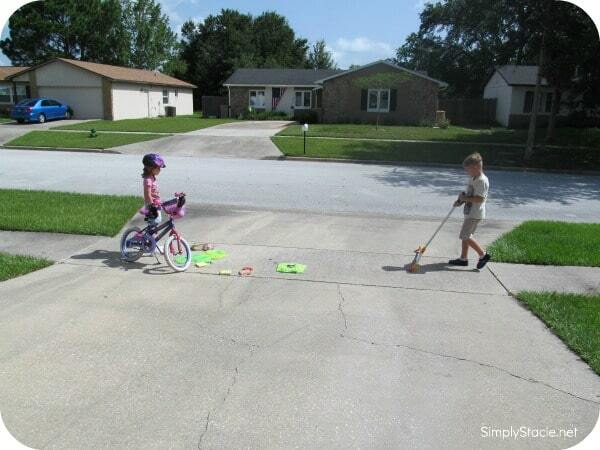 My children were very excited to try out the Chalk City® Activity Set and decided to build a road and obstacle course to use when riding their bikes. Within minutes their friends from the neighborhood were stopping by to see what they were doing and wanted to give it a try themselves. The Road Maker (SRP $19.99) is very easy to use and set up by simply putting two pieces of chalk into the device and then have the child push it around to start creating. It makes straight lines, circles etc. so kids can be as creative as they like when setting up their design. The Road Sign and Obstacle Course Stencils (SRP $15.95 each) are also fun and easy to use and even my four year old could participate in setting up the “roadway” as he learned the “rules of the road”…….Jacob, don’t forget to STOP and watch out for that detour up ahead! For us cleanup is a breeze because the products store easily in the mesh bags and Mother Nature does the rest with a good rain shower. Chalk City® products are a great way to motivate kids to go outside and get moving, have fun, be creative all with one fabulous set of products. It is no wonder that Chalk City® toys have been the recipient of numerous awards…..this product is exceptional and a big bonus is that it is unplugged with no batteries required! You are invited to visit Chalk City® to see these outdoor toys in action and to purchase a set for yourself. You can also purchase online, I found some great money savings deals at Amazon.com or find a retailer near you that carries Chalk City® products. Win a BBQ from 88hours! I love that they give you templates and ideas for activities. How fun, I love how easy this is to use! I love the road making stick thing…I could find all sorts of uses for that in my classroom! I love the Chalk City Road Maker! It sure would save me some back pain from trying to draw it myself for the kids! It keeps them in the lines and out of the road! I love how it has the stencils and it can make a little road they can ride on. Super cute!!! Our son loves creating chalk artwork on our driveway. The chalk city set looks pretty neat and would definitely get some use at our house. I love the road maker and obstacle course stencils! What a cool idea for this. The Chalk City® Road Maker® has won several awards! I like that they give kids templates and ideas for activities. My niece and nephews would LOVE the road maker! Cool woul love to win! The Obstacle Course Stencil looks amazing, not only do they get to have the fun of playing with the chalk, but it also gets them jumping around and thinking. love it! I like that this toy would help my kids be active. I’d like to try the obstacle course stencil. and Obstacle Course Stencils for hours of fun. my boy draws “cat crossing” and “caution” on our sidewalk all the time – he would ADORE the stencils to make uniform signs!! That road maker is awesome! I like the Obstacle Course Stencils. I’m excited to use the road sign stencils so my grandson can learn about what signs mean. I like the Road Maker. I LOVE this stuff! My daycare coulds could have all kinds of fun with this!! My VPK kiddos would love this. That it gets the kids outside. That Roadmaker is very cool! I can see kids having fun with it. I like all the products actually. I love that it’s exercise and art all in one! I like that this product helps kids live an active lifestyle through active, social and creative play. I love that its something to keep the kids active instead of in one spot drawing like they do with just plain chalk. The obstacle course stencil looks fun. I love the obstacle course stencils! Creativity + Activity! it makes you exercise more than just being on the ground drawing – looks more fun! I learned about the exercise involved – it’s true, I remember from making chalk paintings myself! I like the Three Circle game.